There are too many questions for my liking surrounding Incentia Pay’s (ASX:INP) sale of Bartercard back to the very Smiles in Suits that flogged it off to a set-up public company for a huge personal profit. In this post I share some of those questions and come to the conclusion that there has been more skulduggery. As usual all the little people will be paying for these crooks to win time and again. Situation normal around this toxic ‘asset’ Bartercard you may say? Too true and I explain why, this time including a Christian perspective. Enjoy! With the recently announced sale of the Bartercard business, ASX:INP is seen to have done a good thing by some. Maybe, but let’s not be too hasty to congratulate the guy who ‘sold’ it. Iain Dunstain was called in [supposedly] to get the ASX:BPS problem back on track. The story was peddled that Iain was a corporate ring-in to get things turned around for the public who had invested into the BPS Tragedy, . . . oops I mean BPS Technology. The Smiles in Suits (my short code for the head ponchos of the Bartercard Beast, Trevor Dietz, Brian Hall & Tony Weise, and I suppose you could call a dozen more the same, such as Murray ‘Dahl-somebody’ and a bunch of others all in the rort) have supposedly ended up with the same asset back at a fire-sale price. The spin will probably be that ASX:INP (despite its horrendous head-long share price plummet) has other fish to fry and that Bartercard was a distraction. Let’s dig though a little deeper and put this sale into proper context, and then ask a few curly questions. That individuals now own an ‘asset’ previously owned by a publicly listed company raises alarm bells for me. Who decided to sell and how did that process proceed? Where was the public notice or tender process? I know some people who would have been interested in buying it. I think I’m relatively informed but I didn’t know about this sale from the vendor. OK sure the buyers seemed to be touting their impending re-purchase for a very long time before though. There alone is probably good grounds for the ASX to intervene in the sale and conduct some form of inquiry – surely? Then the fact that this business was sold back to the very people who were severed from the company Directorship previously for misconduct – one with known hand-in-the-till insider trading and the other two suspected of the same – ummmm? Hello? Does this not raise more alarm bells for observers? I mentioned in a previous post that it was relatively widely known way back in 2017 that the Smiles in Suits planned to buy their baby back from an Administrator (read in here also, for a song). My take is that their actual plans were stymied in 2017 but that their intentions were well known. H*ll’s teeth I blogged about this more than four years ago, about how ASX:BPS was a rort to corporatise their cash debts from buying the Bartercard Beast off Founder Wayne Sharp for a little too much! That these crooks now have their hands back on the Bartercard business really should grate with the ma’s and pa’s who have paid for these guys’ ill-gotten gain. OK So all’s fair in war you may say . . . buyer beware but when you have foxes in charge – hens don’t have a chance. I warned the ASX exchange before they listed and lodged a complaint at the time. Nothing. I wonder what it will take for these turkeys to actually act. Really I do – maybe now they might listen to the blogger . . . So then what about Iain Dunstan’s role in all of this. Is he really so naive as to think that flicking Bartercard out the back door to the crooks (all of whom BTW have never been dobbed in for the crimes that he’s uncovered) for a sweet little number will not be noticed, or challenged or questioned? The big one is one in which I suggested recently as a possibility – that he was in on the whole thing from the start. In order for this to be reality, one would have to explain his personal investment into ASX:BPS last December 2017 at 28c and his more recent investment of what looks like family money after this sale when the shares were 18c. Is he really that gullible and got conned repeatedly, or this simply a smokescreen with deals done behind the scenes? When one questions the sale process, we should look at the actions of ALL parties to get a true picture. We have a clear culture of greed and dishonesty from the Smiles in Suits going back decades. We have a history within the BPS story of the public getting conned. The actions of the new CEO on the surface look great – flicking the two remaining crooked Directors earlier this year and investing into the company he was out to clean-up. But this could all easily be a ruse. The crooks are highly skilled at doing deals remember and backhanders to crooked Directors who can bring in pension funds to set-up BPS are easy-peesy. Sweet-talking the regulators with BS seemed to work pretty well. What’s one CEO going to cost them? A mil? Half a million? It’s nothing in the whole scheme of things to these crooks – I tell you! If there were other offers on the table for the Bartercard business, and I would think that there were as I’ve spoken to more than one person in the last few years who would have paid handsomely for the business, then Ian’s role in this sale really has to be explored more – that’s if anyone cares. I do believe that the Smiles in Suits have always wanted the thing back. Iain must have known this – he’s no fool, even if he is clean. That he refuses to talk to me, when previously he used to also raises concerns for me. If there was a backroom deal done like I’m presenting here, and a bit of ‘encouragement’ for the seller, I don’t think I’d be wanting to talk to me either! I started by saying that there are too many questions for me to see how this sale stacks up. I’ve chatted about the structure of the deal and the people involved. I haven’t even touched on the numbers, which are also a little bit dubious to my way of thinking. I’d like some answers to the following questions. If you know them, please slip me a note via the Tipline (anonymously if you wish) and I’ll update this post in due course. How did the sale come about and when was it first offered for sale? To whom was it offered and on what terms? Who determined the selling price and on what basis was this price established? If the company ASX:BPS notified the ASX exchange that fraudulent information had been ‘discovered’ what action was taken against the crooks? What involvement did the Board have in the sale and what discussions occurred regarding the potential negative press of selling a public companies asset back into private ownership of the very people terminated and thanked for their services only months earlier? What analysis was completed and by whom prior to the sale in relation to potential claims of insider trading on all the events I’ve discussed above? Who is out there who cares enough for the little people (who appear to be being ripped off yet again) and who can or will seek a stay of the sale pending answers? My gut feel is that the crooks are laughing (again) all the way to the bank and that crime seems to pay for these Smiles in Suits fellas. Additionally it seems to me that Iain Dunstan may have put a huge big splodge on his otherwise squeaky clean resume. If I was an ASX:INP shareholder I’d be asking serious questions, and if I’d had any involvement with installing the new CEO, I’d be looking for leaks in the boat and asking some more very hard questions. I always blog from a Christian perspective, but I rarely speak of Christian matters when discussing Bartercard matters. I will though, here, and now. The concept of living under a blessing or living under a curse is particularly a biblical one. Equal with this principle is the concept of reaping and sowing – we reap what we sow. 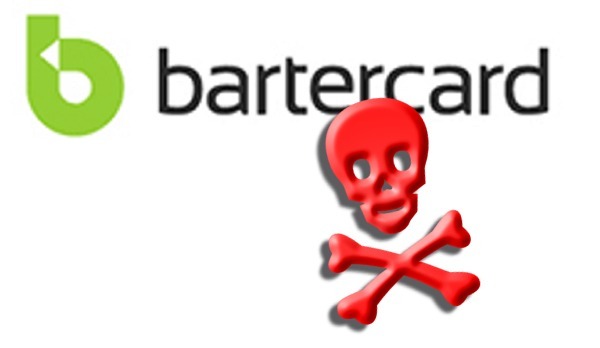 Bartercard was established (sown) with an act of theft – the core software was ‘negotiated’ off another rightful owner through greed and deception. It seems to me to be like the Midas thing – all who touch it turn to gold and die. Put simply, the Bartercard brand and business seems to me to be accursed – literally a form of generational curse. One of the things I find really interesting is that evil still exists. If there is a God who cares and loves, surely He would zap all these crooks and send them off to the hot-house? I’ve mentioned this in other posts a lot, but I think it is far more important to speak the truth and to get the message out there than trying to do God’s work. The idea of fixing all the ills of the world and expecting Nirvana as a result doesn’t appeal to me, especially when I take my cue from the Master. Sure, if we can bring these turkeys to justice let’s do that and with all the energy we have but more importantly I think it is more effective to share the truth. On that note, I was speaking to a Bartercard informant today who has been following me for years and I asked them what they thought about my blogging in relation to Bartercard. I specifically asked them what they thought I’d gotten wrong over the years. Their reply? “Nothing! Absolutely nothing! You’ve been bang on the nail every time in everything,” they said. Good. First part of the job done. Now it’s your turn – get the message out yourself, now and do what you can to make the world a better place. Thanks for swinging by again today. It’s been a hoot – as always! The purpose of [WW2] was to kill the “best of the goyim,” slaughter enough Jews to justify Israel, destroy German nationalism, & create the UN.